Few of these desperadoes would be remembered except for their criminal exploits, but other Irishmen who made their way to South Africa found much greater fame. Arthur Griffith and John MacBride worked in the Transvaal, MacBride on a gold mine, Griffith in news­papers, while they engaged in Irish republican agitation. MacBride subsequently served in the Irish force that fought with the Boers, married Maud Gonne (to Yeats’s distress), took part in the 1916 Easter Rising and was executed; Griffith also returned to Dublin and founded two celebrated journals, the United Irishman and Sinn Fein (a paper before it was a party), and finally became the president of the second Dail, or Irish parliament. 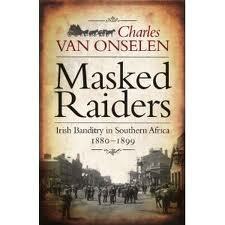 via New Statesman – Masked Raiders: Irish Banditry in Southern Africa (1880-99. Written by: Eoinpurcell on 30 January, 2011.